Audi gained all the accolades at the New York Auto Show when it unveiled the stormy version of already powerful and luxurious Audi RS7. 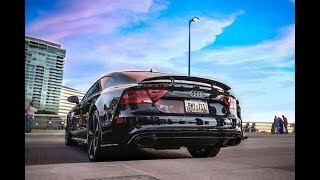 They named this model as Audi RS7 Dynamic Edition 2015 and to be mentioned gave a great reply to their competitors like Mercedes, BMW and Porsche. 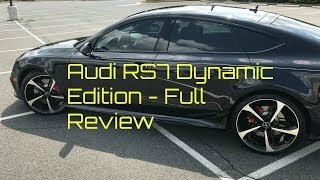 Let us have a look at the review of Audi RS7 Dynamic Edition 2015 to know more about the changes so made apart from name. The interior of Audi RS7 Dynamic Edition 2015 will simply amaze you with its looks. Cabin comes adored with Black Valcona leather wrapped seats featuring contrast stitching in Crimson Red and covering security with looks, they are equipped with matching safety belts. Same saga spread its wings over dashboard where you can notice the red stitching over center console and arm rests. 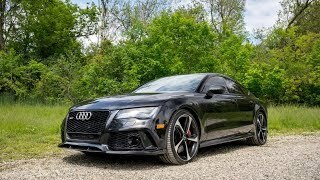 In all we looking at the interior of Audi RS7 Dynamic Edition 2015 we noticed lot of aggression being splattered (at some places forcefully) through its black and red contrast trim. I mean to denote speed why it is always about black and red, I guess it’s time for something new. The exterior of Audi RS7 Dynamic Edition 2015 is lot more than what we have seen in standard model. Starting with the front fascia you have a trapezoidal grille in honeycomb mesh carrying the Audi logo. The part marches towards the bumper right above the carbon-fiber front splitter. Besides this you’ll notice aggressive LED headlights with inculcated daytime running lights. The entire set up sits above the large air vents featuring round fog lamps. Moving towards the rear end things didn’t change much but yes there is a new amalgamation and that come with a carbon-fiber diffuser that sits beneath the bumper. This entire exterior of Audi RS7 Dynamic Edition 2015 rolls over dynamic 21-inch wheels with Gloss Black accents and integrated Tornado Red calipers holding RS7 logos. 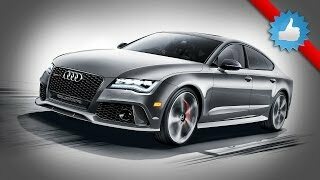 The Audi RS7 Dynamic Edition 2015 comes powered by a 4.0 Liter V8 engine generating total output of 560 hp and peak torque of 700 nm. With this power rolling its massive wheels, the top speed of Audi RS7 Dynamic Edition 2015 can touch 74 mph and is able to sprint from 0-60 mph in 3.7 seconds.